Thank you for your support in the past year. The Mariamma Foundation was founded on July 5, 2012. The name of the foundation is derived from the name of our very first project: Mariammas Children Home. The goal of our foundation is to care for and educate (orphan)children in the region of Tamil Nuda in South India, so they can take better care of themselves in the future. Our policy is focussed on supporting a local enterprise in India during a couple of years in order to improve the quality of the care and education for the children. By closely consulting with the local organization we try to make sure that the project is self-supporting after that period of time. We inform companies and foundations, we give lectures, we organize art and auction services and we are represented at (art)markets. We try to increase our budget by working together with “big good cause foundations” like Cordaid. We recruit volunteers and interns to support our projects with specific expertise. Through newsletters and our website we keep our contributors informed about our activities. We do not collect goods because of the high shipping costs, and because the materials that are needed are cheaper in India and can be manufactured by the people themselves. Since 2007 we mainly help the Social Service Centre in Vandalur, South India, where underprivileged and often disabled (orphan) children are given a home and an education plus a practical vocational study. In 2012 we are setting up a new project for neglected children in South India. The selection procedure is still running. For more information, please see projects and ambitions. In 2006 and 2008, the Mariamma Foundation paid the expenses of necessary renovations and new buildings. In 2009 and 2012 we were able to pay for the nenewal of the elementary schools and secondary schools thanks to the help of Cordaid and Zuyd University. At these schools, children living in the shelter are being educated together with other children. Furthermore, we take care of the salaries of 13 employees, instructors, teachers, mentors of mentally and physically disabled people, cooks and a physiotherapist. We can help out if needed when ad hoc costs have to be incurred. That is how we paid for the surgeries of physically disabled children, thanks to which the children are now able to move by themselves. me to the Mariamma Foundation Website. The English section on our site will be available as soon as possible. 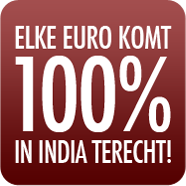 Under the motto “every euro will end up in India for 100%”, the Mariamma Foundation has been able to spend over 300.000 euros in India. Go to donations to see how you can support Mariamma. Part of our contributors transfer a fixed amount of money every year over a period of five years. These are the contributors per notarial act. Fiscally seen, this is a very attractive way of donating because the donated amount is fully deductible. The minimum donating amount has to be a hundred euros a year and needs to be recorded in a notarial act for at least five years. You can download the following PDF documents: Mandate and Mariamma and the income tax authorities. Notary R.A. Thissen from notary office Team Notarissen Thissen Groutars Vrancken in Maastricht does this for free. These contributors are the backbone of our foundation. Thanks to them we can plan ahead, which is very important in ensuring continuity. Often we get donations from people who ask for a contribution to our foundation instead of gifts when it comes to jubilees, birthdays, retirements or christenings. Auctions are being held by schools for example, and some people even recorded our foundation in their testament. DOES THE MONEY END UP IN THE RIGHT PLACE? Yes! The foundation makes sure that the money donated by sponsors completely ends up in India. Furthermore, the foundation monitors everything that happens in India by making appointments and taking action. The foundation contacts the board of the Social Service Centre on a regular basis. Members of our board frequently visit the project, at their own expense of course. Volunteers and interns that are working for the project on behalf of the foundation, are checking the expenditure of the resources. The building scheme is checked by Jan Voorvelt, who’s an architect and a member of the board. To keep an eye on the building scheme and maintenance, the construction is being checked and inspected on site by a Dutch building inspector on behalf of the quality of the construction. The funds of SSC are being verified by a certified accountant in India. In the Netherlands the funds are also verified by an accountant. HOW MUCH IS SPENT ON ORGANIZATIONAL COSTS? Nothing! All the work is done for free. The money is going to the projects directly and for a 100%. The administrative costs are covered by the proceeds of flea markets. The printed matters are sponsored by the workman’s association of the province of Limburg. 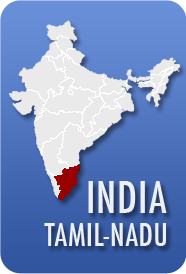 The Mariamma Foundation operates in the Tamil-Nadu region in India. In our opinion, every donated euro can be spent well. Read more about the Mariamma Foundation and the project that we work on. The Mariamma Foundation likes to get in contact with people, preferably professionals, who want to work as a volunteer in SSC VANDALUR for a period of three months. In view of obtaining a visa, the maximum term is four months. Interns are welcome to volunteer as well. Our policy is to support projects focused on shelter and education of poor, disabled children and orphans in South India for a period of around five years. For this we select projects that are in the early stages and need support. We want to help them improve the quality of the activities as well as offer our help with realizing a better accommodation and its interior. At the beginning of the period we indicate that our support will last for a maximum of five years. During that period we consult and evaluate on a regular basis and watch how a project can stand on its own feet after five years. This Newsletter’s edition is a jubilee newsletter to celebrate one jubilee. A few things will pass in review but the main focus will be an overview of our activities in the past 5 years of the SSC (Social Service Centre in Vandalur). It has already been 10 years that Stichting Mariamma was founded! 5 July 2002 the charter of foundation was executed before the notary Reinier Thissen. Thanks to your help we have been able to complete several projects in the federal state of Tamil Nadu, South India. In total, thanks to many donors, we have been able to transfer 337,253.50 euros to India. The first 5 years we focused on supporting the Mariamma’s Children Home in Mahabilpuram, a relief center for orphans and young Tsunami victims. After those 5 years we were able to continue financial support for 2 students, thus enabling them to study, a study which they now have successfully completed. The SSC is a home for underprivileged handicapped children. Before the start of each project we agree with the organization we offer them support for a 5 year period. After these 5 years it is expected they are able to independently continue both financially and organizationally. By means of our financial support and thanks to the volunteers and interns provided by us the SSC has been able to rebuild the existing orphanage and school into an institution consisting of a hostel for orphans and handicapped children, a primary school and high school (10 classes), a school for mentally handicapped children, vocational training in office automation, type writing, tailoring and jobs in a candle work shop. Furthermore, we have paid the wages for part of the staff and teachers, physiotherapist, work coaches and surgeries of handicapped children. Who live at the hostel? The Social Service Center is lead by an executive committee which consists of six people. Honorary secretary Mrs. Kousalya David is the widow of the founder of the SCC, Dr. William David. The staff consists of approximately 13 people, including caretakers, 2 cooks and administrative personnel. In addition there are: 1 physiotherapist, 1 creative therapist, (special) teachers, 18 instructors and approximately 10 supporting staff members. 1,936.00 euros for surgeries of handicapped children. and 23 girls, in the age of 4 to 19 years). In 2011, 151 junior students took their exams in the shorthand and type writing (English) courses and 102 students passed their exam. For the tailoring course, 64 out of 65 students passed their exam. A fantastic result and even better: 49 of them were able to find a job. For the office automation course, 31 out of 36 candidates (of which 19 are handicapped) passed their exam and 33 were able to find a job. At the moment, 14 handicapped are working in the candle work shop. The existing hostel has been extended with an additional wing and on the resulting square a floor and a ramp for wheelchairs have been built. This building houses the new accommodation for mentally handicapped children education, administration, type writing class room, computer class room, candle work shop, tailor’s, kitchen and dining room, multifunctional area (homework, leisure, parties), sleeping facilities for residents and part of the staff. The existing school has been extended with a wing and on top of the whole building another floor has been built. There are 10 class rooms, a small library, staff room and sanitary facilities. The construction has been inspected periodically by 2 inspectors of the Stichting Thomas Bouwprojecten. Thank you for your input and work during a number of months at the SSC Vandalur. Based on our experiences with the first two completed projects, as well as the knowledge we can count on fantastic support from you as donors, we as the executive committee have decided to set up and complete a new project in the coming 5 years. The basis for this was already laid in 2011. The next newsletter will tell you more about that. Partly thanks to webmaster Roger Weijenberg our website has been transformed. A clear lay out makes it easier for the reader to get a good impression of several topics. We recommend you to take a look at the familiar web address. Roger, thank you for all your hard work and the sponsorship you promised. Our jubilee party will be organized by 4 students from the Zuyd Hogeschool Maastricht and the Faculty of International Business and Communication. Eva Duijvestijn, Mark Meyer, Yvette Ramakers and Nicky Rasmussen are second year students and are enthusiastically working on organizing this party. 31 May 2012 you can see and experience the result. We are happy we are able to tell you more about our new project in India: building will start! In our Newsletter of December 2012 we provided you with all the relevant basic information. The accommodation is especially meant for underprivileged (multiple) handicapped girls from the lowest class of the population. There will be class rooms, therapy, sleeping and accommodation facilities. The past period, numerous activities have taken place. Firstly, sister Prudentia of the Franciscan Sisters of St. Joseph has been consulted intensively. She again has confirmed that the congregation will take responsibility for the center’s further organization. Secondly, after intense conversation with experts from international aid organizations the objective has been reoriented. As a result, the building’s size has been adapted while keeping its functions intact. Thirdly, the conversations showed the building should serve as a central aid station for the area which would facilitate decentralized care which therefore could take place on an extramural basis. Based on that, the plans were adapted. The situation drawing shows our new building (4) has been included in a complex consisting of a small hospital, a provincial cloister and a relief center for HIV patients. All facilities include regional focused medical help and support and will be managed by the Sisters themselves. In the past period, the technical details of the construction plans have been completed. Hans Schiebroeck , of the Stichting Thomas Bouw (STB) with which we will collaborate, has measured the ground in India and has been in touch with the constructors, contractors and the Sisters. The plans have now been completed and at the beginning of January 2014 Anne Rijenga (STB) will go to India to arrange the contracting. If everything goes according to plan, we will be able to start building the first phase which will be ready in August. Thanks to your donations and donations from sponsors, we are able to finance the first phase. In the coming 3 years we will continue with phase 2 and the remaining necessary in- and exterior facilities. The construction of our third project Mariamma Illam Acharapakkam started on September 14, 2014. This autumn, Wil Rutten will step down as general director and provincial secretary of the Noord-Brabant province. For that occasion, he has started a campaign to contribute to the tiled floor of our new home for (multiple) handicapped girls in Acharapakkam. A floor literally forms the basis of these girls’ existence as in India people barely have any furniture. Instead, the floor is used for eating, sleeping and studying. It would be fantastic if Wil’s guests together would be able to make this floor become real. As a thank you all donors will have their name on a list that will be placed in the new center, Illam Mariamma. Our recommending committee: Theo Bovens, Felix Meurders, Wil Rutten and Theo Schuyt during a brainstorm session with our executive committee. The financial annual report 2012 of our foundation is available at our treasurer. The annual report 2012 set up by our secretary is posted on our website: www.mariamma.nl. Should you have any questions regarding the content or need further information, please contact us. The result is a combination of Christian and Hindu ritual indicating a wonderful symbolic start of construction. The start of construction has some delay produced by the slow licensing procedures, a modified field situation -waardoor drawings had to be adjusted and a serious lack of water for a long period of drought. The contractor has started the first phase and once the finances permit is immediately followed by the second stage connected to it. For the benefit of the future management and operation of the home, the sisters have prepared a plan to ensure that there is sufficient and expert knowledge at that time. Sister francis she completed her corse and she is appointed in Manampathy. There the sisters have a boarding for girls. She will look after those children for the time being and do the screening work in Acharappakam. Acharappakam is close to manampathy. The home is picking up. Now two workers we have got. Totally 13 children are there. Three inmates and 10 day scholars. From 1st may to 15 May 2017 sister Francis with the assistant girl will visit the villages around select few more children. One Physiotherapist visits the home once a week and gives exercise and there is a lot of improvement in the children. This May during the transfer we shall appoint more sisters so that the home will go on well.Sister Francis is coming to Chennai tomorrow and I have asked her to get the quotation. As soon as we get it I will send it to you. I was planning to send you this report since a few days but to some important work I could not send it. I visited Mariamma Illam twice in 10 days time. The building looks good. The kitchen block is getting ready. Only little bit of plastering and flooring left to be completed. As regards the functioning of the home I have the following report. We have appointed one more sister for the home. Her name is Sister Lumina.Now we have altogether 13 children including both boys and girls. Four of them stay in the home and others come daily and attend class and go. We will be sending a four wheeler vehicle from Perambalur to Acharappakam for bringing children from the village for classes. The vehicle will arrive very soon. We have interviewed a physiotherapist to be appointed in the home. Her salary is Rs. 15000.00 per month. We have already bought two wheelchairs and a two wheeler scooter for them. We will reach all these material to Acharapakkam in two days time. We have ordered a water purifier also for the children for drinking water. We do hope to admit more children in the home since two sisters are there. We are sure that everything will go well as time pass on.It is because of your generous contribution. We remember all of you gratefully. 2. Individual and group activities. 3. Types of disabilities we have. Children are in the age group of 4 to 18 years. Most of these children learn through communication chart. To improve their sensory activities we give activities like swing, slide, bridge walking, ladder climbing, and running etc. These activities are given before the class starts. Four children are not independent in all daily act ivies. They transfer objects with minimal verbal prmpta. They are trained in toilet skills. Motor Functions. Holding pencil, coloring and painting within the boundary. They are also taught block printing within the boundary.They are trained to use their fingers to hold pencil, crayon etc. They do block printing, stamping etc. We include academic studies in the daily living activities. Lessons like poems, letters in Tamil and English, simple counting, names of domestic and wild animals. They are able to recite alphabets A to Z. They are able to hold pencil and crayon and colour pictures. It is really pleasant to see the children doing all types of activities including making jewels, flowers, pictures. Etc. Sister Francis is a very talented sister in taking care of the children. It is a very rare talent. I had already sent youa statement of account of total receipt and expenditure. In case you need the total account again I shall do it. Now I am giving you our present requirement. We need to pay the contractor a sum of Rs 2170000.00 plus the extra cost of cement and the electricity charges. These two items may not be high. This account was settled with the contractor by Anne. The following sponsors have supported the Foundation Mariamma in recent years.